Toro and Bradman: a new partnership at the crease | The International Cricket Hall of Fame. 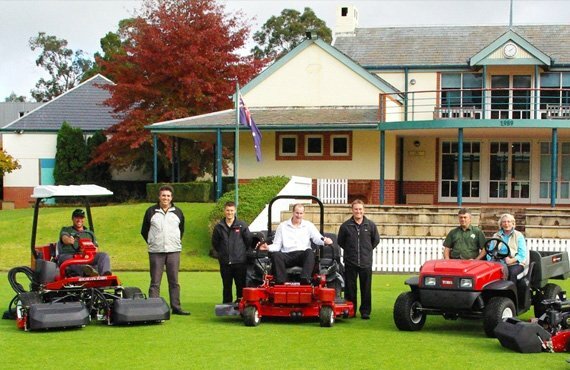 The Bradman Foundation and Toro Australia have signed a partnership agreement making Toro the exclusive turf maintenance equipment and irrigation systems provider for Bradman Oval until 2015. Executive Director of the Bradman Foundation, Ms Rina Hore, said that the Foundation was impressed by Toro’s international track record and experience in providing machinery for iconic sports grounds around the world. “There are high public expectations about the quality of a historical site such as Bradman Oval, and the use of Toro’s state of the art machinery, which feature superior cutting techniques, will make a significant improvement to the ground surface. “We look forward to a partnership with Toro not just on the oval, but also in the development of the surrounding park environment,” said Ms Hore. Paul Prout, National Corporate Accounts Manager for Toro Equipment commented: “Toro are very proud to be associated with the Bradman Foundation and the International Cricket Hall of Fame and we look forward to helping raise the profile of the oval and surrounding areas. We will do our utmost to assist the Foundation in achieving their goal for Bradman Oval to become a cricket oval of international standards”. Ms Hore said a further benefit Toro brings to the partnership is their willingness to share their technology and expertise with cricket followers, based on their ability to develop and adapt machinery for ground keeping solutions in different conditions around the world. Photo above (Left to right): Bradman groundsman Josh Woodcock, Toro’s Pat O’Shannessy and Paul Masterson, Bradman Commercial Manager Andrew Farley, Toro’s National Corporate Accounts manager Paul Prout, Andrew Ireland from Irelands Mittagong and Bradman Executive Director Rina Hore.